Washington’s broken tax system is taking a huge toll on our students and families – and endangering our democracy and economy to boot. It doesn’t have to be this way. Many of Washington’s elected leaders themselves benefited from better public funding of our state’s colleges and universities. The question is, how are they going to make that same opportunity available to today’s high school students? More student aid (i.e. loans) are not the answer. 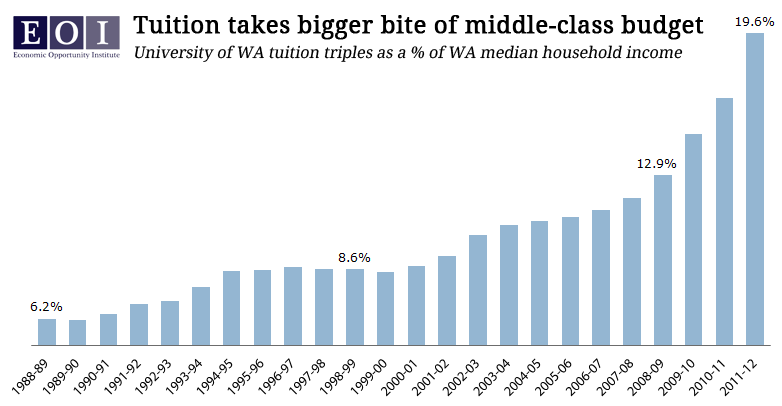 The “high-tuition/high-aid” model in vogue at many universities – including the University of Washington – is actually a step backward in terms of access and affordability for all but the wealthiest of students. [It’s] an open opportunity for any graduating senior — limited by only their own academic performance — to attend their local community college or a state public university, tuition-free. In exchange, a legal quid pro quo: the student contributes 1.5 percent of their income, if they attended community college, or 4 percent if they attended a university, for 25 years. But there’s still the matter of the public obligation to support higher education, which is politically trickier, but no less necessary. Two good places our legislators can look for that revenue are: ending tax expenditures (closing loopholes, scrutinizing giveaways, etc.) and broadening the sales tax base to include (now tax-free) services. Taking proactive steps like these now with help limit the economic damage of Washington’s current higher ed financing model, and set our state on a path to a deeper and more robust economic recovery in the years ahead.